My mother loved Christmas. She started her preparation during the after Christmas sales each year as she stocked up on half-price wrapping paper, Christmas cards, ornaments, and sometimes even a present or two. Throughout the year, she would buy presents for her friends and family as she came across something she thought they would love and then she’d tuck it away until December. By the end of October, she had typically finished with present buying and turned her focus to the other aspects of the celebrations. Every year, we would bake Christmas cookies together. Mother made several kinds each year to give away. She also made her “famous” Chinese Fried Walnuts, which I had forgotten until my dad asked me the other day if I ever made them. I told him no, but that I would give them a try if he could find the recipe in my mother’s recipe box for me. Every year she made sugar cookies for us to decorate, but she always had a few new kinds to try, some of which were successful and some not. I remember two things we tried together, in particular. One of them was no-cook mints, which never set, and we ended up pitching the lot. She and I laughed about those mints every year. The year I was in French class, I offered to make something for our Christmas party. I chose the Buche du Noel without realizing what I was getting myself into. My mother was appalled when she realized how much chocolate and how many eggs were required for that cake. Fortunately for both of us, my grandmother was visiting. She had made jelly rolls many times and she taught me how to do it. It was the first of many Christmas logs (the English translation of Buche du Noel)I made over the years. I don’t make them every year, but I will make one this year since we will have a full table of people to eat it. Then there was mother’s Christmas brunch, which she held for many years. She would make her fruit cup, several quiches, and many other delicious treats and invite people over for an open house one Saturday morning each December. People loved her food, the beautiful decorations, and my mother’s friendly warmth. She loved people and had many, many friends so our house was always full that morning. Decorating was a large part of our celebrations. It was decreed by my mother that no Christmas music or decorations were allowed until after Thanksgiving. She always liked each season to be celebrated for itself. I found out years later that the Christmas music ban was actually to keep my brother and me from listening to the annoying Chipmunks Christmas record year-round. She figured that she would lose her sanity if she had to listen to it more than one month a year. We had many other beautiful Christmas albums though, and the house was filled with music all month long. Every year we went out as a family for a “real” Christmas tree. Some years we got them from corner lots. The years we lived in Connecticut, we lived next door to a Christmas tree farm so we simply popped down the road and cut ourselves a tree. Then we decorated it together although once my brother and I went off to college, my mother did it on her own. We put Christmas music on, my dad put on the strings of lights with the huge colored bulbs in the days before mini lights, and we placed the ornaments. Mother always cautioned us to place them carefully in an appropriate spot for the ornament, something I still do to this day. Then there were the icicles, those strings of silver paper you put on the tree after all the ornaments were in place. My dad and brother liked to just toss them on while mother and I placed them carefully, one strand at a time. She finally stopped using them because they got caught in the dog’s feet and because they had the tendency to clog up the vacuum. Over the years, she collected handmade ornaments. She would make a different kind of ornament every year and so did many of her friends. Eventually the tree was covered with only handmade ornaments and she gave me the antique glass ornaments, which belonged to my grandparents and great-grandparents for my tree. I also have many ornaments that she made for me. 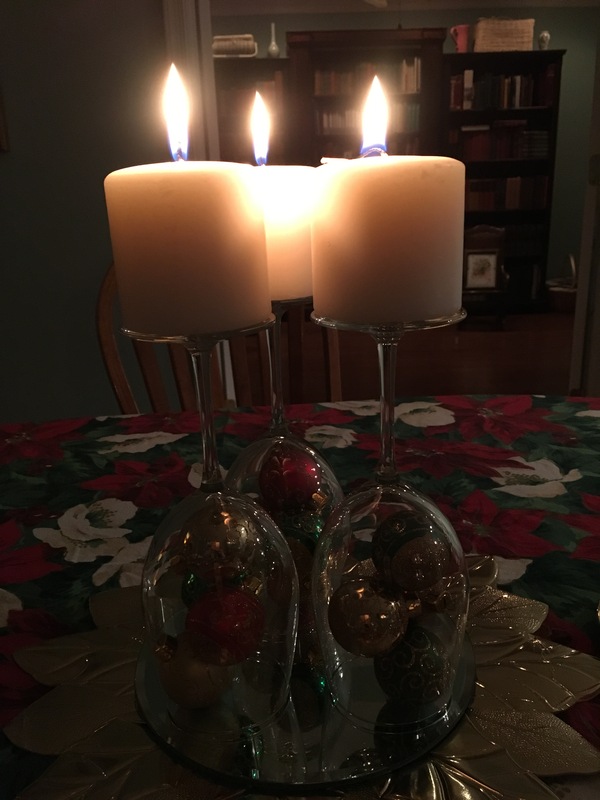 We had window candles in every window and bits and pieces of holiday cheer spread throughout the house. A yearly box of holly from my grandfather was eagerly looked for. He had two mammoth holly trees on his farm, one with the traditional red berries and one with yellow berries. Each year at the beginning of December he would send my mother a big box of holly, which she arranged in a cut glass vase in the corner of the living room. It would last throughout the month and was appreciated by every one who came to the house. Then there were the Christmas cards, stacks and stacks of them. My parents sent Christmas cards to dozens of people every year. Mother wrote little notes and sometimes long notes on each one, sharing the highlights of our year. She was faithful to correspond with friends and relatives, even those she would never see again. It is one tradition that I discontinued in my years of single motherhood and I’m often sorry that I did as I have lost contact with old friends and cousins over the years. When my brother and I were small, our Christmas stockings were ones that my grandmother hand-knitted for us. When we grew up, mother cross-stitched stockings for every one in the family. They were works of art, which required several months so she did one a year for each of the adults in the family and made simpler applique stockings for the grandchildren. We still hang those stockings each year at our house. Of course, church was a central part of the Christmas season for our family and still is. We would celebrate each Sunday of Advent, go to the annual Christmas dinner, hear the Christmas cantata, go to the Christmas Eve Candlelight service, and other special celebrations, such as caroling throughout December. Mother did her best to keep Christ at the center of our thoughts although it was difficult with the excitement of presents and cookies and parties filling our minds. On Christmas Eve, my father sat down with us and read ‘Twas the Night Before Christmas every year before bed. Then we would put out cookies and milk for Santa and a carrot for Rudolph and go to bed. Mother always warned us that Santa wouldn’t come if we weren’t asleep. She often told us the story of when she was a little girl. She wouldn’t go to sleep one Christmas Eve. Finally, she heard a loud voice, coming from downstairs. “Is Veda Lee asleep yet?” Her mother responded that she was not. Mother heard the jolly voice continue, “Well, alright, I will bring presents to the rest of the street and come back, but if she still isn’t asleep, I won’t leave any presents for her.” Mother said that she never went to sleep so quickly before or since as she did that night. We were always impressed that our mother had heard Santa’s own voice and were quick to fall asleep ourselves, just in case. On January 6th, my mother put all the decorations away. She taught us that Christmas was over after the twelve days. I did my best to bring my children up with many of the same traditions as my parents enjoyed with us. We replaced the Christmas Eve story with the Biblical account and told the story of Santa Claus with a wink and a nod so that the boys believed in him as they did other fairy tales. However, we kept most of the same traditions, adding a few of our own. I often feel that Mother would be pleased to know that many of her traditions and customs have been continued in my home, and hopefully, in the homes and hearts of her grandchildren.